I bake to celebrate friends’ birthdays. I bake for dinner parties. I bake to test out a new, intriguing recipe. I bake for weddings (well, I’ve just done one). I bake for bake-offs. I bake for my students when they have a long lab or a big test. Sometimes I just need to bake… for me. Not because I need to, eat but because I need to bake. It relaxes me, calms me, and then finally cheers me up. Yesterday was one of those days when I just needed to bake. As usual, what I always want to bake is a pie. I didn’t want to go to the store (even though it is literally a quarter mile from my house… Just so cold! 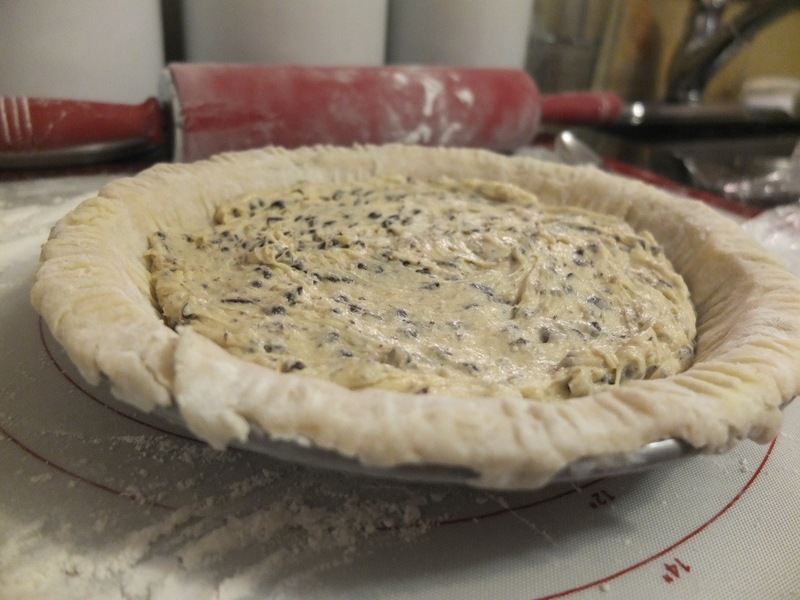 ), and I didn’t have any normal pie ingredients. I did have the normal baking essentials: flour, sugar, butter, and chocolate. What kind of pie can you make with that? 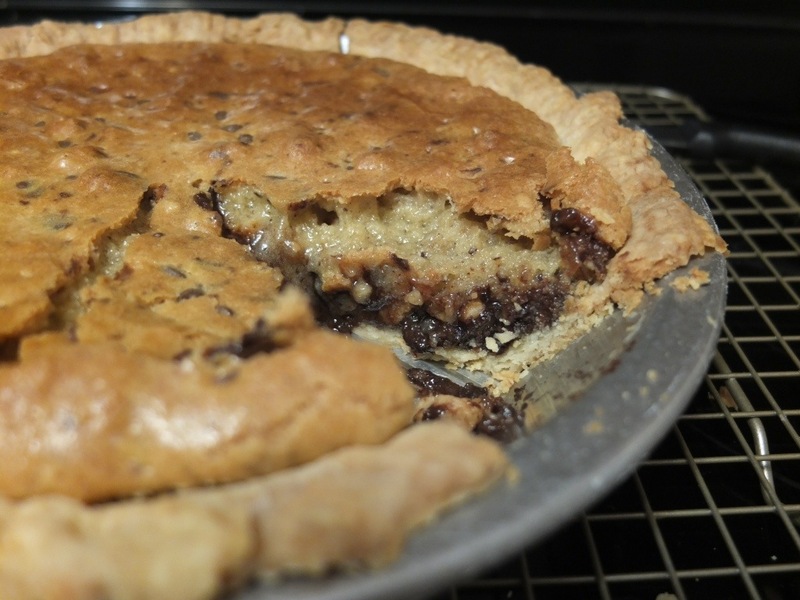 Well… a chocolate chip cookie pie! I ate one slice right out of the oven with a cold glass of milk, and it was the perfect way to end another successful baking night. 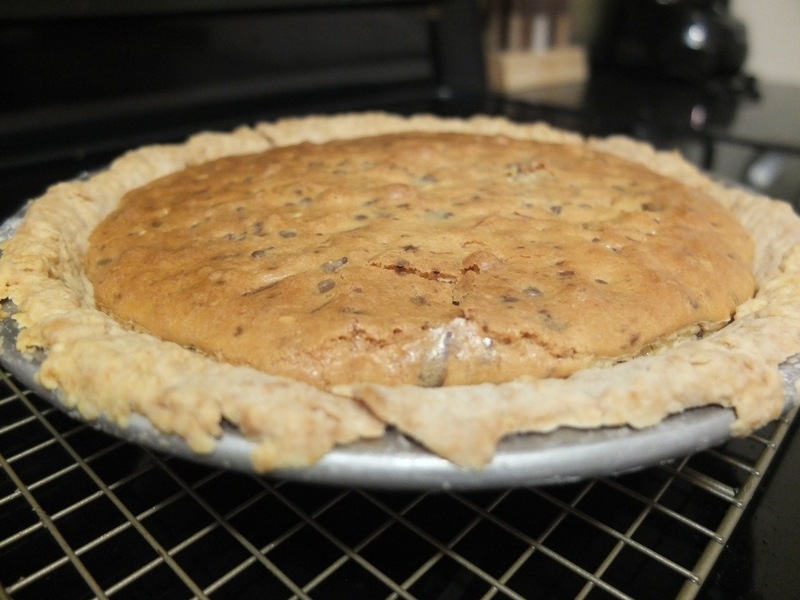 I chilled the pie overnight, and it tasted even better today as the ingredients all came together. cut in butter & crisco. using a fork, mix in cold water. cover in plastic and chill for 1/2 an hour. in a mixer, blend butter and sugars until creamy. on low, mix in flour and salt until just incorporated. stir in chocolate and walnuts. pour in chocolate chip mixture. sprinkle on sea salt, if desired. bake at 325 for 55 minutes. Cherry on Top is back in full force and I like it!